Ningyo Joruri Bunraku (It is also called Nigyo Joruri or simply Bunraku) is one of the traditional Japanese theatrical arts. It was born by combining the puppet show with Shamisen music and Joruri. Before explaining Ningyo Joruri, I need to talk about Joruri briefly. Joruri is a narative music played by Tayu accompanied by Shamisen (Japanese instrument like a guitar). The lyrics is not simply a song but it includes lines and disctiptions of the act of the performers. So the recitation by Tayu has epical strength. Gidayu-bushi, Tokiwatsu-bushi and Kiyomoto-bushi are the representing styles. Ningyo Joruri is added puppet to Gidayu-bushi. Joruri has its origin in Muromachi era (14-16th century), but Ningyo Joruri is regarded to be started in Edo era (17-19th century). It was flowered in Osaka by Tayu, Gidayu Takemoto and writers like Monzaemon Chikamatasu and Kinokaion. 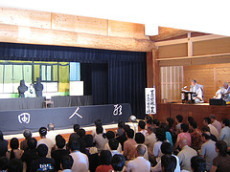 The word 'Bunraku' used to indicate the theater where Ningyo Joruri was played, but now it indicates Ningyo Joruri itself. Ningyo Joruri consists of three roles, Tayu, Shamisen player and Puppet player. Basically it is played only by man. Tayu and Shamisen player play on the hang-over stage 'Yuka' which is set on the righthand side. They appear on the rolling plate. The legs of Pupppet players ared hiden by the fence called 'Tesuri' which at the same time becomes the ground for the puppets. Tesuri is sometimes used as a word to indicate puppet. Tayu is a Joruri storyteller who basically recites alone. There are many kinds in Joruri, but in Ningyo Joruri, he recites Gidayu-bushi. Gidayu-bushi consists of 'Kotoba' (conversation without Shamisen accompaniment), 'Jiai' (description of the scene with Shamisen accompaniment) and 'Fushi' (singing with Shamisen accompaniment). He plays the roles of different personalities. Sometimes another Tayu replace on the way, when the piece is very long. And sometimes multipul Tayu line up when there is dialogue. Shamisen is one of the Japanese chordophone instruments. The origin is Sangen of China which came to Osaka Japan via Ryukyu in 16th century. There are 3 kinds of Shamisen by the thickness of the neck, thick neck, middle neck and slim neck and thick neck Shamisen is used in Joruri. Occasionary slim neck Shamisen is used by the scene. Shamisen player sits folding his legs under himself, opening the knees widely and putting the hips on the ground. 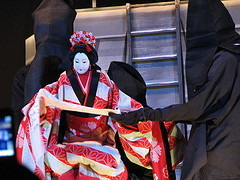 Shamisen player takes a role of a facilitator of the stage, triggering Tayu and Puppet player actions and expressing give-and-take relationship with Tayu. There is no music score. Long time ago, one puppet is operated by one player, but from 18th century, it has been operated by 3 players. Main player operates head and right hand. Left player operates left hand. Leg player operates legs. They keep time with the sign called 'Zu' by main player. They normally wear black costume and hide their face with black cloth, but main player sometimes appears his face at the important scene. Puppet of Ningyo Joruri is not meady-made. 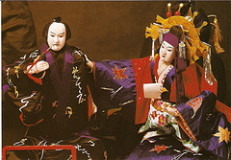 According to the stage and the role, puppet artist adjust the head and Tokoyama (barber) makes up its hair and puppet player fineshes up by dressing the costume which costumer prepares. Head differs by the gender, age, status and character. But same head can be used for different personage by changing the hair and makeup. 'Sugawara Denju Tenarai Kagami', 'Kanadehon Chusingura', 'Yoshitsune Senbon Zakura' are the representative works. The scenario drives from the fact and story of the everyday life of the time. Reality is the most important aspect. It expresses the subtlety of the everyday life of the ordinary people with laughter and tears. 'Sonezaki Shinju', 'Meidono Hikyaku', 'Shinban Utazaimon' are the representative works. It became independent from Noh-Kyogen, Kabuki and Bunraku. It is a small bright and speedy piece with musical and dancing elements. It has the effect of changing the mood of the audience during the long piece called 'Hikinuki' and changing the depressed mind of the audience before going out called 'Oidashi'. But Keigogo sometimes is not categorized and express the liric scene with Jidaimono and Sewamono. 'Tsuri Onna', 'Gojobashi', 'Dangouri', 'Momijigari' are the representative works.